Sarah Lummis is a senior Psychology major at Goucher College. Her interests in psychology revolve mainly around cognitive psychology, specifically memory. Outside of the classroom, she enjoys running, baking, and hiking with my dog. She is also a captain of Goucher’s equestrian team. According to a recent study, stereotypes affect us in more ways than we may think, especially when it comes to women and math. Now take another minute to think of what stereotypes exist about the groups you associate with. Do you think you conform to these stereotypes? Even if you answered “no” to that last question, there is evidence that the fear of living up to a certain stereotype can affect the way we act or perform without us even knowing. It’s a commonly researched concept in psychology known as “stereotype threat,” and it refers to the risk of confirming a negative stereotype about a group you belong to. Psychologists have found that stereotype threat can affect our performance in an array of different situations, including memory tests (1), intelligence tests (2), and even golf putting (3). When people taking are given some kind of reminder of a part of their identity that may be attached to a stereotype that would imply a detriment in their performance (e.g., the idea that white males are less intelligent than Asian males), that group falls victim to stereotype threat and therefore performs worse than they otherwise would. 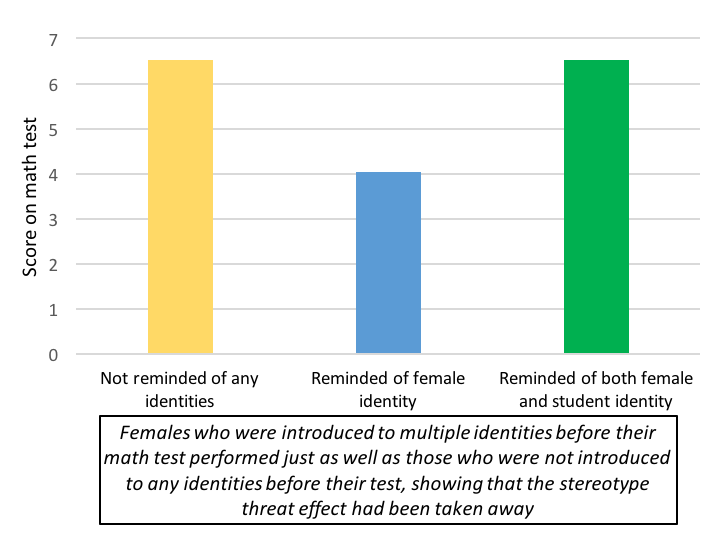 In four connected experiments, one group of researchers (4) were able to dive into a deeper understanding of how and why stereotype threat works, and what we can do to combat it. Scientists believe that introducing a positive stereotype that applies to a person will alleviate the effects of stereotype threat that is brought on by introducing a negative stereotype. In order to test this theory, researchers chose to work with a performance-based stereotype that a lot of us know so well: the idea that “women are bad at math”. All four experiments were carried out with female college students who were asked to take a math test. In the first experiment, students who read a short introduction explaining how women often face difficulties in mathematics achieved lower performance on the math test than those who did not read this intro. However, female students who read an introduction highlighting how women struggle with math and how college students usually excel at math did not show the same drop in performance. By conducting another experiment, scientists were able to narrow down the issue of stereotype threat to a matter of which identities we associate ourselves with more on an unconscious level. After administering the same variations of introductions, the experimenters then gave female college students a task in which they saw a word on a computer screen and had to press a button indicating whether or not the word described them. Sure enough, those who read the introduction that only highlighted females and math reacted much faster to associate themselves with words such as “girl” and “lady,” but those who were exposed to both the gender stereotype and the student stereotype were quicker to associate themselves with words like “pupil” and “scholar,” compared to female-related words. So, clearly the identities we unconsciously associate ourselves with are affected by when we are reminded of them, and being reminded of two of our identities typically causes us to err on the side of the more positive one given the situation. Picture taken by the author and published with permission from the person in the photo. This idea of identity accessibility actually has to do with memory. Our working memory– which is a kind of memory that is associated with present consciousness— dictates what identities we associate ourselves with more at any given time. It also dictates most of our ability to perform in situations such as taking tests; it pulls our knowledge of concepts that we have learned before and manipulates this knowledge to apply specifically to the problem in front of us. Researchers have guessed that the reason stereotype threat directly affects performance, then, is because our unconscious ruminative thoughts about negative stereotypes, use up our working memory resources, therefore compromising our ability to perform. It turns out we have a lot more going on in our heads when we take a test than just the test questions! So, what we can take away from this study is that there are easy ways to alleviate the negative effects of stereotype threat. We can keep this in mind when looking at standardized testing, a highly performance-based practice in which students are often reminded of certain identities beforehand (i.e., via the introductory demographic questions). Demographic questions can easily be administered in a way that brings up multiple identities and therefore combats stereotype threat, such as simply asking, are you a college student? after asking, what is your gender? An even more general take-away message we can get from this work is that each one of us is a person with a complex identity that is not limited to just one aspect, and therefore should not be held back by negative stereotypes that threaten just one small part of us. And with the fight to alleviate stereotype threat, we’re one step closer to evening out the playing field. (1) Schmader, T., & Johns, M. (2003). Converging evidence that stereotype threat reduces working memory capacity. Journal Of Personality and Social Psychology, 85, 440-452. (2) Croizet, J., Després, G., Gauzins, M., Huguet, P., Leyens, J. (2004). Stereotype threat undermines intellectual performance by triggering a disruptive mental load. Personality and Social Psychology Bulletin, 30, 721-731. (3) Grimm, L. R., Lewis, B., Maddox, W. T., Markman, A. B. (2016). Stereotype fit effects for golf putting nonexperts. Sport, Exercise, and Performance Psychology, 5, 39-51. (4) Rydell, R. J., McConnell, A. R., & Beilock, S. L. (2009). Multiple social identities and stereotype threat: Imbalance, accessibility, and working memory. Journal of Personality and Social Psychology, 96, 949-966.